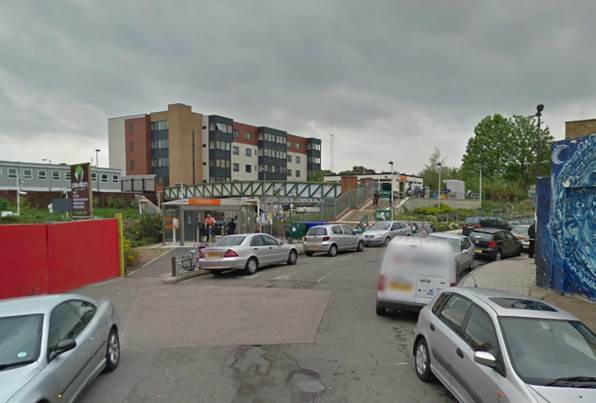 Three Bridges is an area and a railway station in Crawley. It used to be a big part in my life. My dad was a commuter up to London. Come rain, snow, storm or sunshine he used to cycle to Three Bridges which was on the main line between London and Brighton and from there he could get a train up to London Bridge. When my grandparents lived in Tunbridge Wells we could get a train to there from Three Bridges and that was a chuffing steam train. Later they moved back to their original home town of Bexhill and we still had to use Three Bridges, changing trains at Haywards Heath. And then I became a train spotter and Three Bridges was a great station for that. We could guarantee to see 16 electric trains per hour plus the hourly steamer to East Grinstead. In addition there’d be an occasional steam hauled goods train and also engineering trains for the railway had a large depot just by the station. There was also a steam engine shed which supplied locos for various steam operated lines in the area as well as for the goods and engineering trains. On summer Sundays the excursion trains would just stream down to the coast. The notebook always needed to be in hand to record these. From the outside the station had a very unassuming air – very much a quiet country station as seen in this postcard. To judge by the cars that dates from the 1950s so it represents a station that I knew. 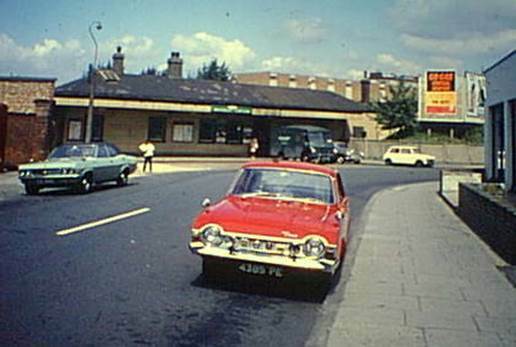 Strangely it hasn’t changed much, despite the building of Crawley New Town all around it. That area out the front was the car park. Now it is utterly a drop off point only. The old goods yard, as at many a station, is now quite a substantial car park. What has really changed is the road. What was a quiet lane is now a four laned highway. Just behind the photographer traffic in huge quantities weaves from lane to lane. But the building retains something of the old world charm although I believe even more trains might stop or pass through the station now. My childhood home, once in the peace and quiet of a village, got attacked on two fronts. Crawley New Town arrived from the south and east and reached within a couple of hundred yards of our village home. And then Gatwick Airport was built to the north and the ‘country’ end of the runway was little more than a mile from the house. Gatwick Airport train station proved to be quite a good train spotting venue although that was quite a distance from home – 3 or so miles. I was there on 1st May 1966 which was a Sunday. This was very much at the end of my train spotting career. Twenty days later I had my first date with the girl friend who became and still is my wife. I was on the very cusp of adulthood and for once I’ll quote the bible. And maybe that was why I had a camera. I could pretend I was recording a passing scene which, in a way, I was. This was one of the pictures I took that day. It shows one of the Southern Electric units that were built when the Brighton line was electrified in 1933. By 1966 these units had past their use by date. They did feel like something from a past age and I loved them for it. They were classified as 4-LAV. The four indicated they were a unit with four carriages. The LAV indicated (would you believe) that it had a lavatory. Yet three of the coaches were plain compartments with no side corridor or anything. If you were in one of those and needed the loo you’d have to have waited until a stop and then dashed along the platform to the one carriage which had toilet facilities. And then, at one time, you’d have had a choice of two, depending on whether you were a first or third class traveller. Amazing! 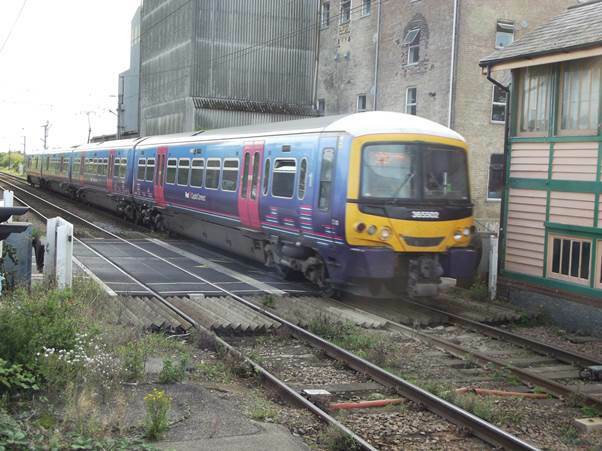 These units spent more than thirty years trundling up and down the line between London and Brighton. 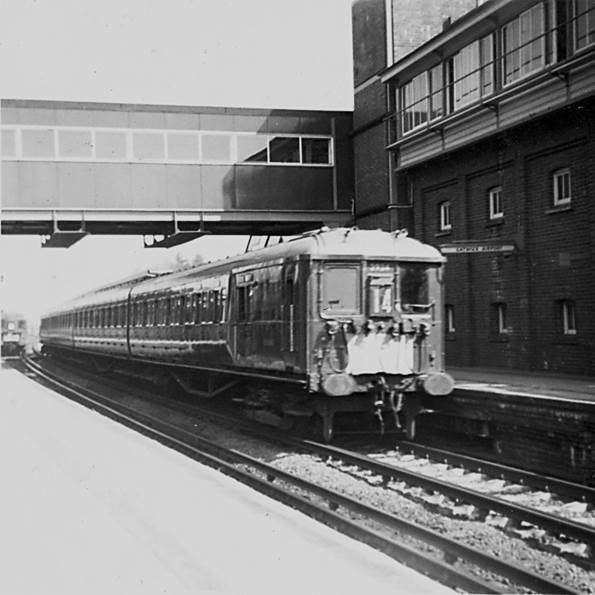 This particular unit was on service 14 which was the hourly service from Victoria to Brighton calling at Clapham Junction, East Croydon, Purley and all stations to Brighton. The well-constructed timetable meant you could change at key stations and get a quicker train for much of the journey. The old 4-LAV units were soon swept into oblivion by the new gangwayed throughout trains. They, in their turn, have been swept away, having been castigated as ‘slam door trains. But these old ones live on, and are loved, in the memory. Oh, by the way, in the background of my photo there is a 2 BIL unit. 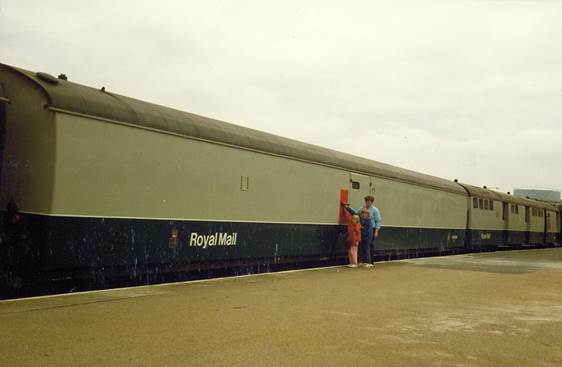 These were slightly newer than the LAVs and had 2 carriages with a lavatory in each – 2 car Bi lavatory sets. 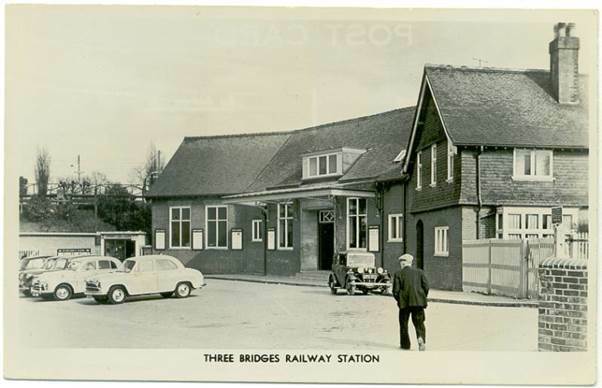 Other things of interest in the photo are the smoke deflectors under the footbridge – Gatwick Airport Station dates from the 50s when there were still plenty of steam trains about and the rather traditional style signal box incorporated into the new station when it was built. This is a railway based blog post. OK! Switch off now and get on with your life. Or maybe you’ll stay and share just a little of mine. 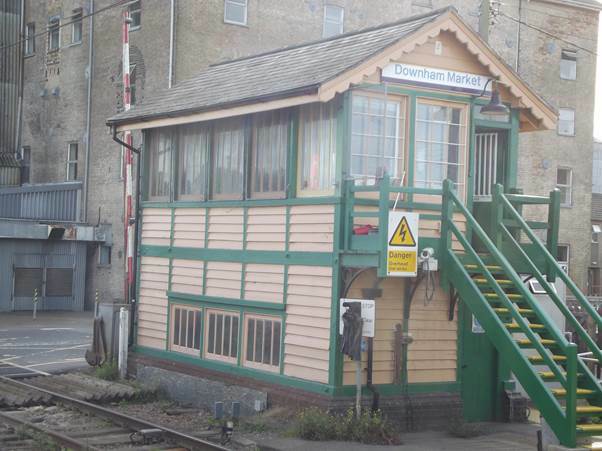 Downham Market, in Norfolk, has a station and a signal box. 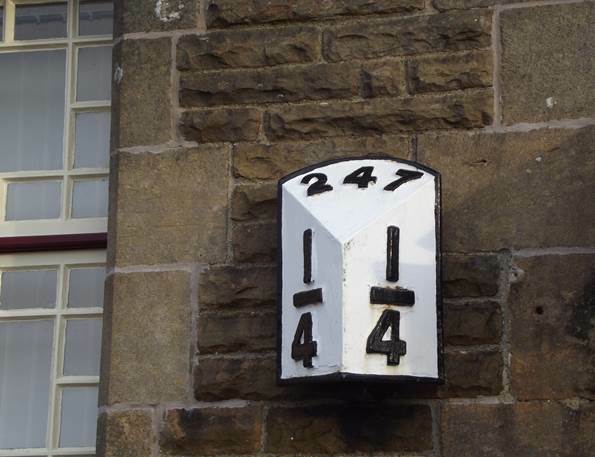 Back in the summer of this year 26 old signal boxes were listed as historic monuments, This means they should be conserved so that future generations can see the way in which trains were managed and controlled in the past. One of the 26 is the one at Downham Market. I was there, perchance, the other day. I was staying with friends and another friend was arriving by train at the station. I was just pleased to see a signal box that reminded me of my past. I did not know it was one of the listed 26 at the time. This box dates from 1883. Apparently parts of it are made of wood blocks cut to look like stone. I see no real evidence for this here. It’s a bit quirky that this signal box may be controlling very new trains racing between London and Kings Lynn at speeds of up to 100mph. 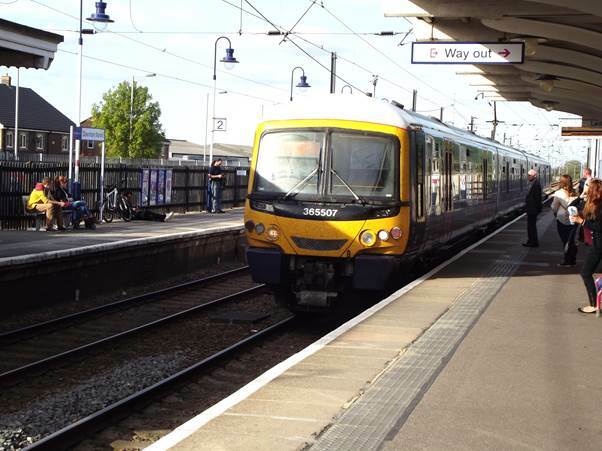 But at Downham Market, the trains stop. 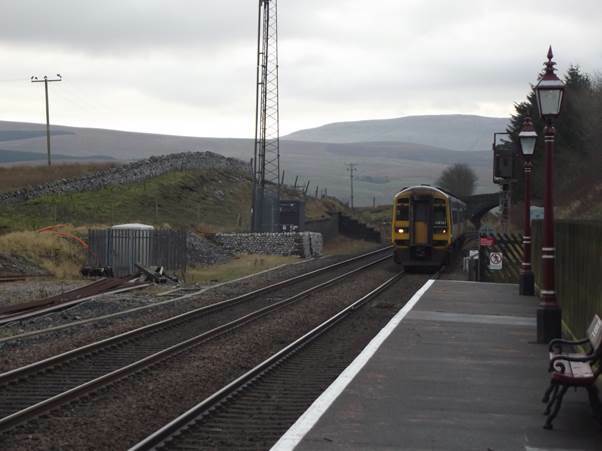 Here’s one approaching the station and below is another, stopped at the platform. 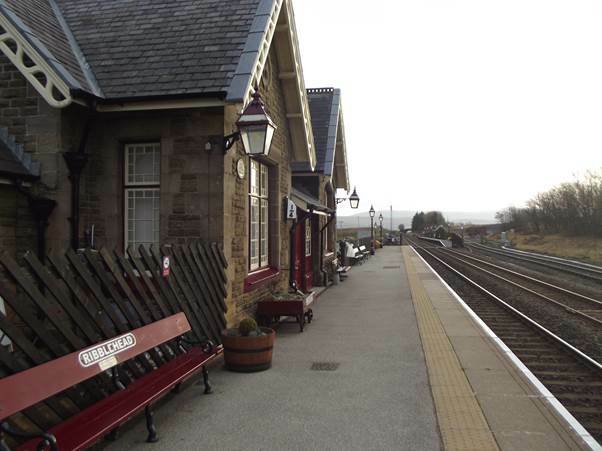 The station dates from the 1840s and is very presentable. Swanage is a lovely seaside town in Dorset. 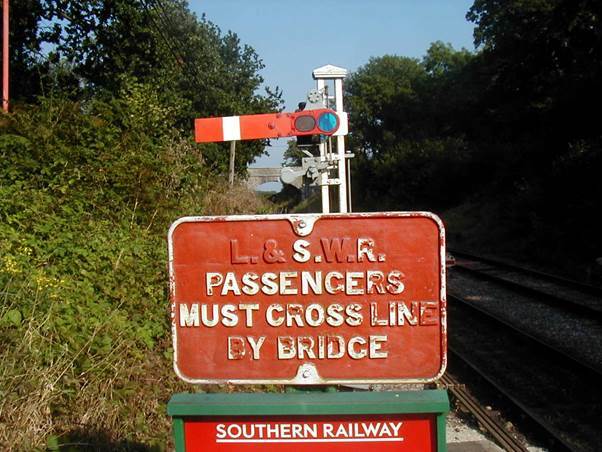 In its infinite wisdom, British Railways and our oh so thoughtful government decided to close the branch railway which runs down the Isle of Purbeck with effect from January 1972. There had been much argument and many delays in managing to close the line. 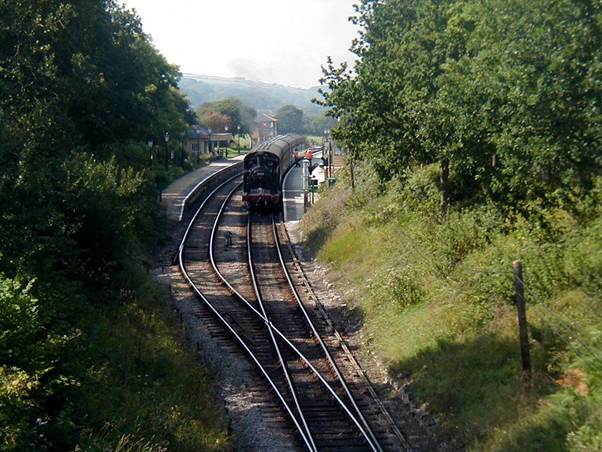 Despite the rapid formation of the Swanage Railway Society – who hoped to be able to run service trains throughout the year, subsidised by steam trains in the summer, the rails were ripped up. 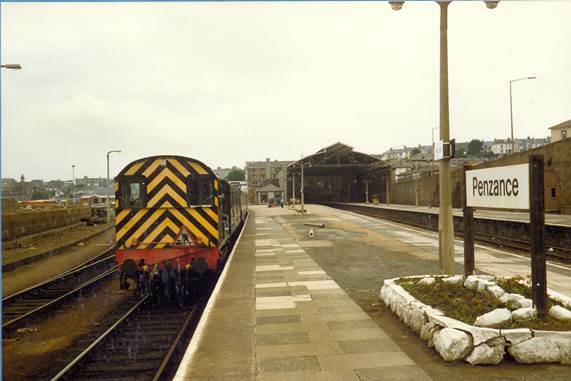 When, at last, railway services did restart, in 1979, it was for very short distances in and out of Swanage station. 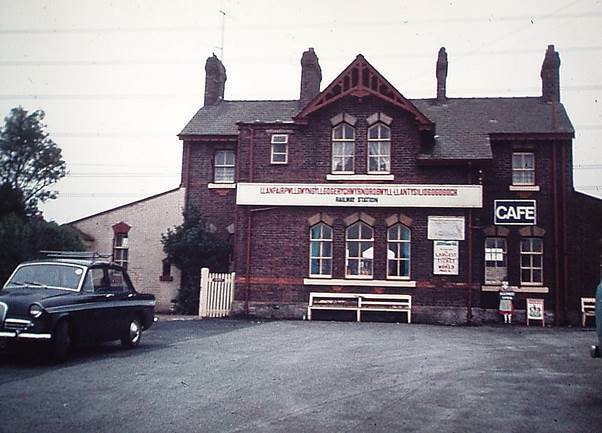 In 1988 the line was extended to a brand new station called Harman’s Cross – near a crossroads of that name. A lovely wayside station was built there and, although the line is now much longer, the station remains and is a crossing point for trains. Here’s a view of the station from a nearby road bridge. 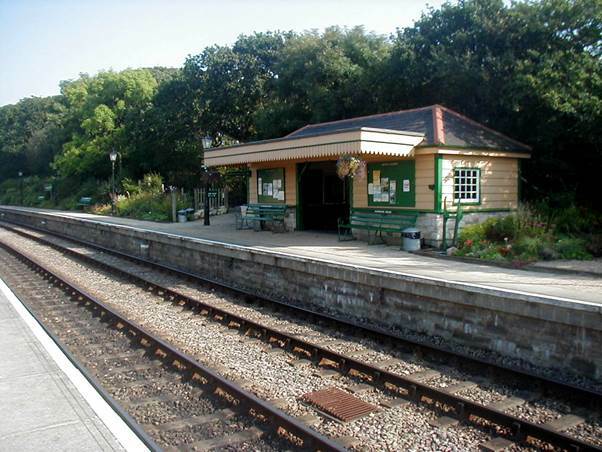 A Swanage bound train, headed by an old London and South Western Railway M7 class tank waits at the platform. 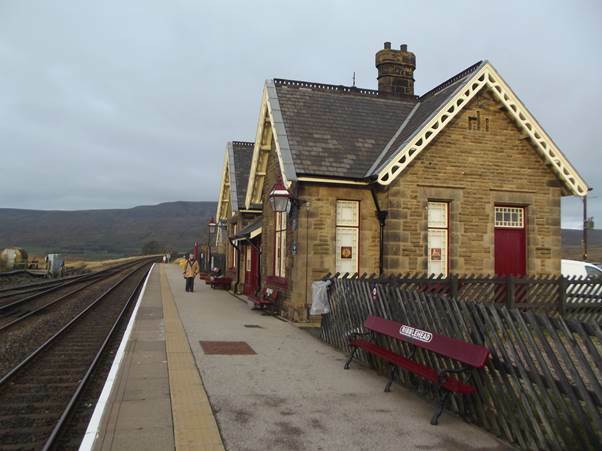 It is a timeless scene although in fact the station dates from 1988 and the photo was taken in 2004. The train departs and everything about it is perfect. 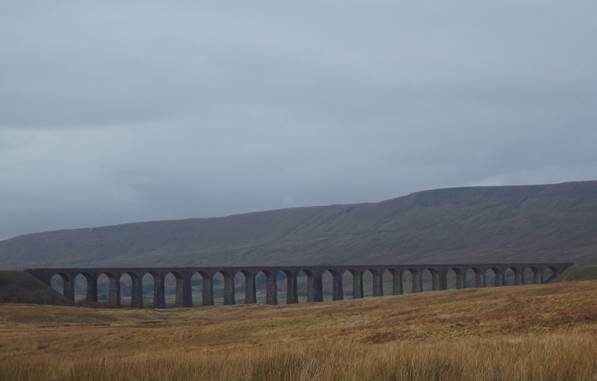 It could have been from my train spotting days in 1960. 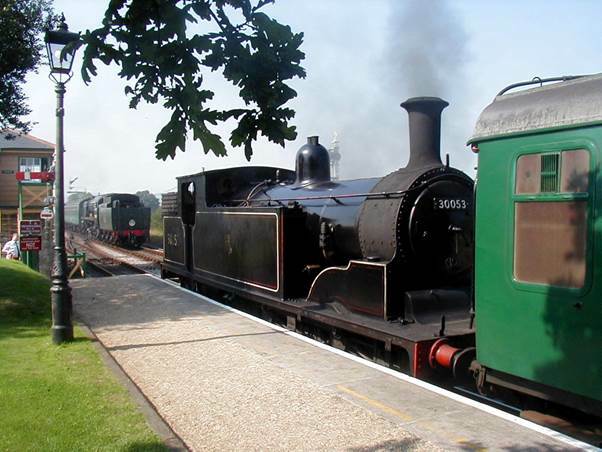 The M7 is in British Railways condition and she has a rake of coaches in Southern Region green. Yes, it really is perfection. Now the opposite view as the train returns. 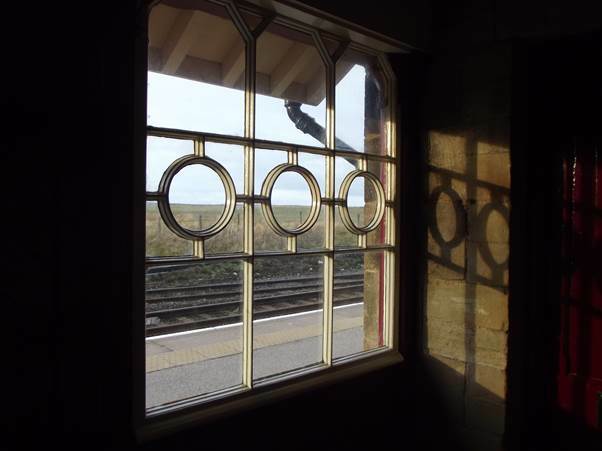 In building Harman’s Cross, all the right things were done to give it the real ambience of a local station. The signs and signals are just as they should be, and would have been in days of yore. There’s our lovely little M7 tank waiting whilst the down train is arriving. That’s in charge of a big engine – a rebuilt West Country class loco. Sadly – it is a problem on heritage lines – she has to run tender first. Turntables are hugely expensive structures and most heritage lines don’t have them. But never mind. 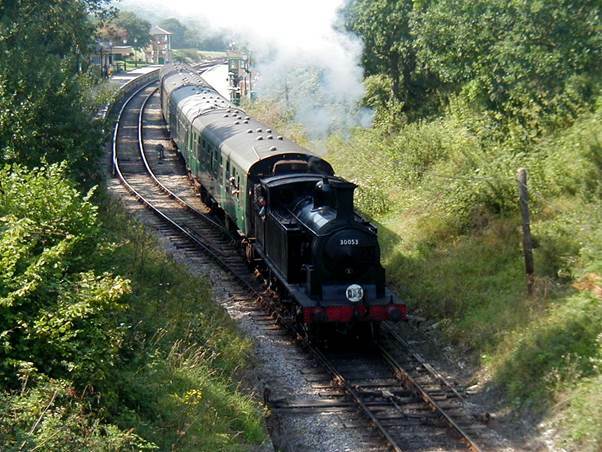 On its return from Swanage the engine will be right way round. Here’s the platform shelter at Harman’s Cross. It really is delightful although fifty years ago the dustbins would never have had black bin liners. And here comes that big West Country class loco. 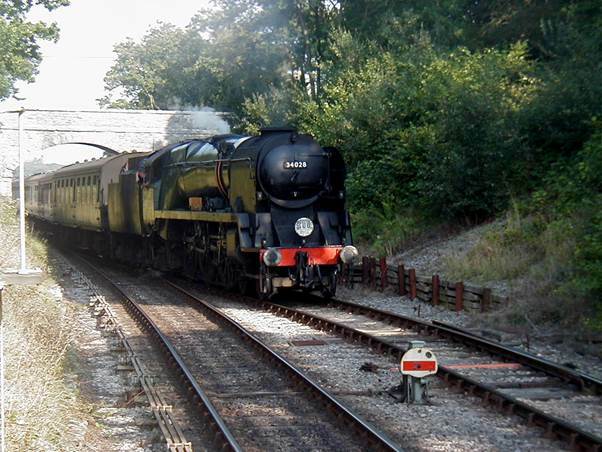 It’s heading away from Swanage and will terminate at Norden which is near Corfe Castle. 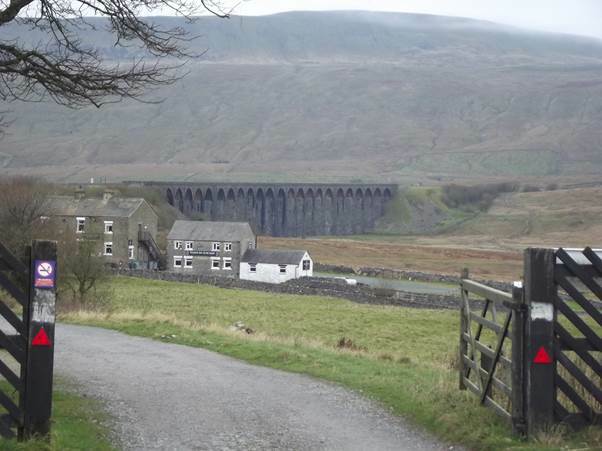 The railway operates Norden as a park and ride station. 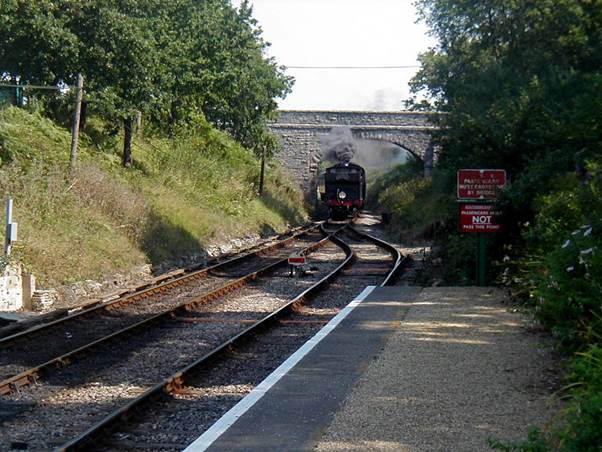 And with the superb situation of Swanage station, it’s an ideal way to arrive at the seaside town. Regular readers might be disappointed if they didn’t get a bit of railway here, every now and again so here’s a railway image that is just a bit different. There’s no train or loco in sight. This photo was taken on 10th October 1998 and I was using my first digital camera at the time. It was basic and on high quality took pictures which measure 640 by 480 pixels – still an ideal size for blogs. 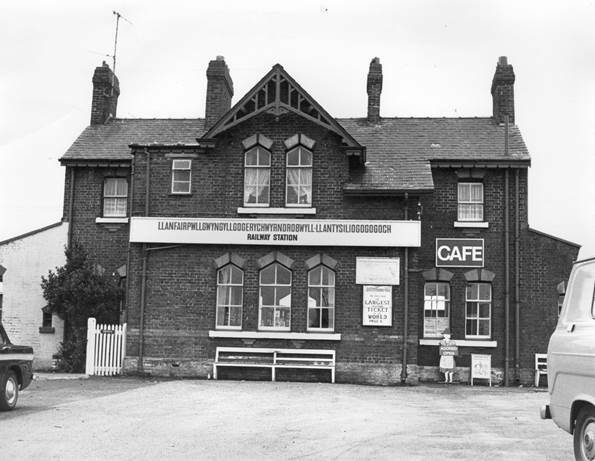 The location is Salisbury Station which used to be open and, on this occasion I was meeting my son off a train. These days the station is a fortress, barred to non-passengers. On one occasion, I had to really argue to be allowed on to a platform to carry bags for my pregnant daughter. That seems a shame to me. I always enjoyed those platform greetings and even the departures were OK as well. 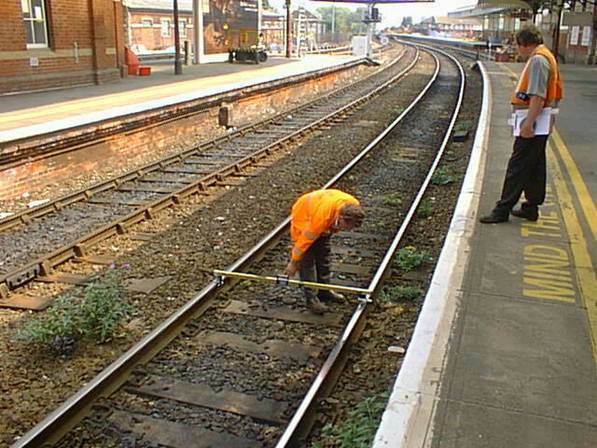 The chap standing on the track is using a gauge to make sure the two rails are four feet eight and a half inches apart. If not, trains could de-rail. I think he is also measuring the camber. We can see there is a slight curve through the station and the outer rail should be a little higher than the inner one. I’ll assume all was OK, for not long afterwards my son arrived. Track enthusiasts will notice that the near track is composed of flat bottomed rail mounted on wooden sleepers whilst the other track is of the older (much older) bull head type with chairs, keys and fishplates. Some enthusiasts will be horrified at the weed growth through the ballast – and that certainly looks in need of a clean-up. I wonder what it is like now. Sadly, I rarely use the train because, quite simply, the car is cheaper. 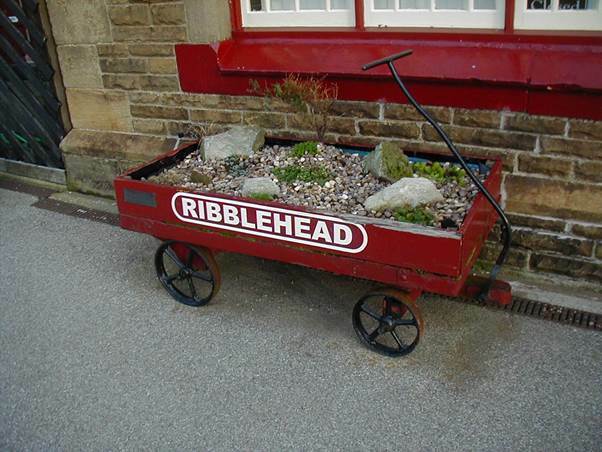 My children tend to arrive by car these days and, if I do meet anyone at Salisbury I’m not allowed on the platform. So I may never know if the old rail has been replaced, if the ballast looks better and whether weeds have been removed.